As the audience sat underneath a splatter of colors, the University Chorale and Chamber Singers performed “True Colors: Exploring Diversity Through Musical Expression” Friday in Morgan Auditorium. Assistant Professor of Music Irene Messoloras, who conducted the concert, explained the concept of synesthesia, a term used to explain people who can not only hear sounds, but actually see them, before the concert began. As the audience took their seats, the lights turned off and a display of splattered colors were projected on a screen as gentle music was played. The aspect of synesthesia tied in with the array of different colors displayed during each of the songs performed. The show opened with the Chamber Singers’ rendition of Cyndi Lauper’s 1980s classic, “True Colors,” which could not have been a better opener for the show considering the title behind the entire performance. 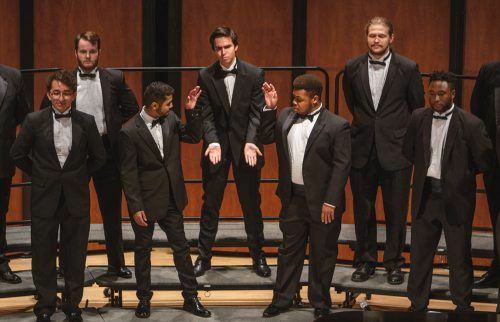 “Sound Off,” by the Chamber Singers Men’s Choir, which featured a display of yellow lights on the side panels of the room drew laughter and applause from the audience. “The ‘Sound Off’ piece had to be my favorite because it was performed so humorously and made everyone enjoy the song,” Valerie Aguayo, Baldwin Park resident, said. The song portrays a conversation between an R&B singer and a member of the British aristocracy being moderated by a U.S. army drill sergeant. “The R&B singer is trying to persuade the member of the British aristocracy to kind of just like let loose, and join me, come on hangout with me, let’s have a party. You really hear the colors and different parts of sections within this piece,” Messoloras said. The piece included beats from a paint bucket being used as a drum, and the audience could not take their eyes off the performance as the choir members began dancing along to the beat of the music. Messoloras said that diversity and emotions are easily portrayed through colors and music. The song was inspiring, with lyrics that told a story of being unapologetically yourself and having no shame in that. “This theme of diversity and inclusivity definitely paid off with a lot of the controversies that have been going on, on campus and in town hall,” chorale member Oceano Marshall, junior communications major, said. The performance was bright, displaying all the colors of the rainbow on the side panels as a way to show equality. He briefly explained how important the music department has been since coming to ULV. 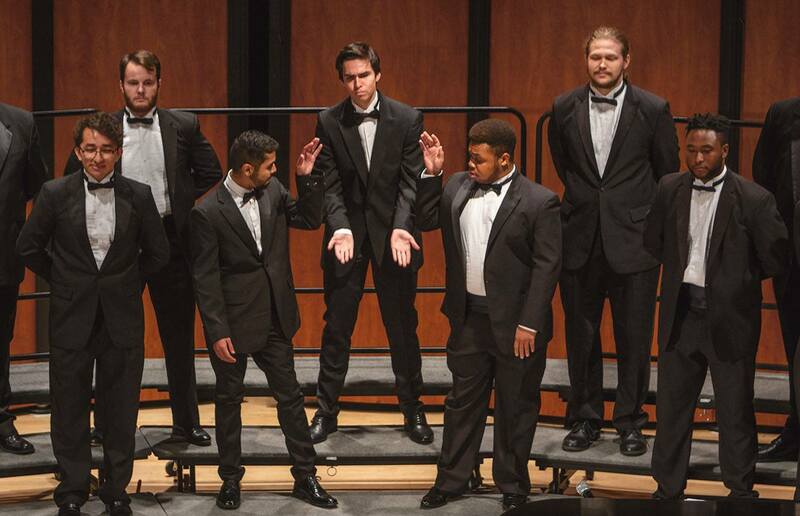 The next performance for the University Chorale and Chamber Singers will be their Holiday Spectacular at 6 p.m. Dec. 9 in Morgan Auditorium. Arianna Rodriguez can be reached at arianna.rodriguez@laverne.edu. The performance was incredible, the singing awesome. They get better every time we see them perform. Its a joy to hear their voices and you can see and feel their love of the music. Congratulations on another great concert.